They worked on the principle of publishing and setting up my website www.leanmarketingpress.com/frogs and then taking one third of the royalities of each sale. This worked well for me as there was no money in the pot for publishing and allowed someone who had always wanted to write their own story. In terms of promotion, it was done through local press, emails to databases of contacts and depending on their goodwill to support me. I held a book signing in a local bookstore and also held my own book launch raising money for a well needed mother and baby unit in Cameroon. I now sell books at the back of the room when I do a speaking gig. I have asked schools to stock books in their libaries. I approached as many forum sites as possible where individuals would be looking for help to overcome challenge. ‘Cut the Strings’ was originally written in the hope that it would help other people to face challeng e and adversity with the knowledge that they CAN get through things. Not only can they get through things it is possible to make a decision to get through and come out the other side stronger and more determined than ever. It has not been written with an intention of gaining sympathy nor to get any negative emotion stirred. It was written to motivate individuals into action. Since writing this outcome has become even more important. I have noticed that once we decide to achieve, we do so more easily if we keep our fingers on the pulse, keep our determination and motivation. Notice a photograph is developed in the dark and out of the negative comes a beautiful image. This is the same as us going through any challenge. We do grow, we do get stronger. 2) Overcoming is much healthier for you than overwhelming. strong and resourceful you are as you overcome challenges. 3) Wishing things were different doesn’t work. 5) Determination is a key factor in any challenging situation. hold a gift for you. 7) Control all that can be controlled. Stop worrying about that which is beyond your control. You’ll deal with challenges as they occur. 8) Independence does not mean you have to be alone. 9) Don’t be afraid to fail but make sure you hop right back into action. stronger and even more resourceful as a result. I wrote back. It turned out that Lynn Grocott was someone I had known quite well through both school and church, but hadn’t seen for over thirty years. 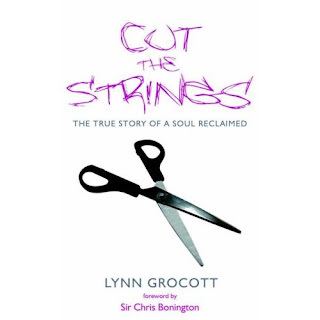 Lynn had written a book called ‘Cut the Strings.’ I was shocked to discover that it was about, amongst other things, the horrific abuse she suffered as a child. I was shocked because I remembered this bright, happy go lucky girl in her early teens, and never suspected that her tears at the end of Church camp were not only because a good time was ending, but because she now had to return to a house of horrors. I thought that writing my book and trying to get it published had been a difficult task. Lynn’s apprenticeship as an author had been a life of suffering. But that wasn’t her only reason for writing. Despite all of the cards being stacked against her (her parents committed suicide, she contracted MS,) she is now one of the most positive and life-affirming people you could ever meet. Lynn’s life was turned around through confidence coaching. Now I have always maintained a fair share of cynicism regarding this sort of system, but I was suddenly confronted by someone I knew, someone who had been through so much, but who was positive, hopeful, and could still experience joy in abundance. We started to exchange regular emails, catching up and reminiscing about our shared background. For weeks I either forgot to mention that I had written a novel, or when I did think to say I felt guilty that I had originally accepted the contact because I thought it might further my ambitions. Then came the day that I did mention it, and Lynn asked if she could be of any help. From that point my approach to getting my novel out there has taken me in so many new and interesting directions. These will be the subject of my next blogs. Help… There’s a Mad Woman in my Tardis! I felt a need to make changes, to regenerate, but didn’t know where the energy to do so was going to come from. I haven’t mentioned yet a sad fact about my life which is my obsession with the T.V. programme Dr. Who. I find the idea of regeneration fascinating, and think of it as a modern myth representing the changes that we all need to make at points in our lives in order not just to stay alive but to really live. It was sometime in November when I was checking my emails that I found that someone had sent me a message through MySpace. The message claimed to be from someone called Lynn, who went to the same school as me, and now wanted to be my friend on MySpace. l wasn’t in the mood for making friends with anyone. I remembered David Tennant’s Doctor, grieving after leaving Rose in a parallel universe, (non-afficianados please bear with me) then suddenly finding that there was a strange mad woman in his Tardis. That’s all I need- a stalker. I popped downstairs to refill my glass, and mentioned the message to my wife. She suggested it might be someone after money. Of course! The profile mentioned fundraising.